Salmon fishing this fall has been a little more work than we are used to. We have been catching fish every day but the number of fish is nowhere near what we had last year. We have pretty much been sticking with fishing eggs under floats to put fish in the boat. 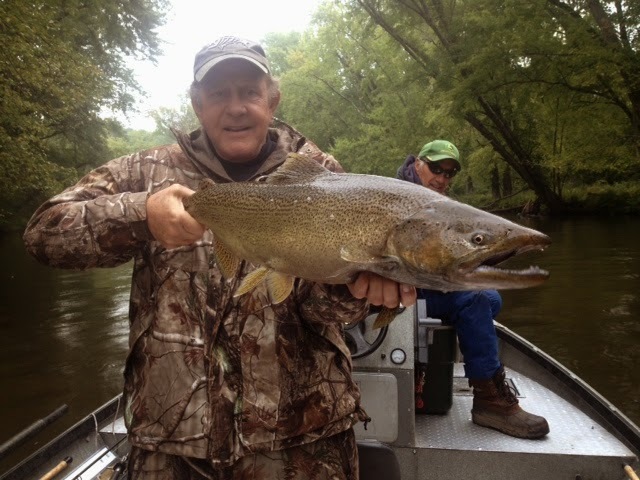 The up side to things is slower fishing means less boat traffic and with Michigan's archery season opening Wednesday there should be even less fishing pressure. There are a few random Steelhead being caught in some rivers especially to the north and we will be after them as soon as numbers increase. Bright sunny days and mid to high 70 degree weather for the last week plus has not been what we need to get whatever push of kings may be waiting to come but it is windy and raining as I type so it could still get good. Below are a couple pictures of Kings we have put in the net over the last week or so since my last report. 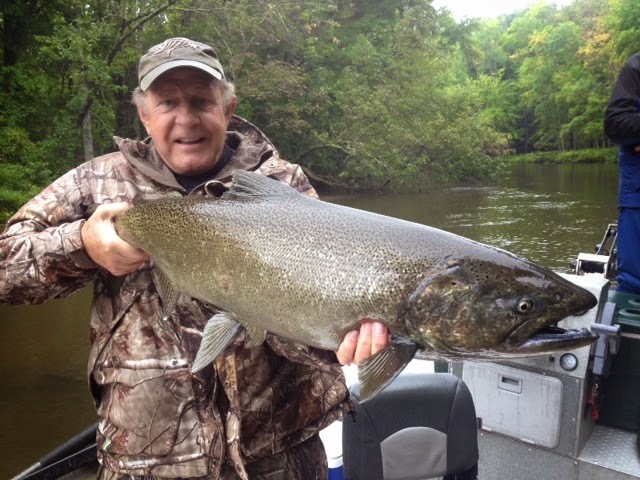 We are back in Michigan and on the river chasing King Salmon. We have been primarily float fishing eggs the last few days but have hit a few fish casting crank baits as well. The fishing is by no means "on fire" but we are hooking a decent number of fish each day. Boat traffic has been light most likely due to slower fishing than everyone is used to. The fish are fighting hard and looking for cover so a heavy drag and good leader has been the only way to put them in the net. Most rivers should have fishable numbers within the next week which should keep any one spot from getting too congested with boat traffic. Openings are on the lighter side but if you are looking to get out for Kings or Steelhead this fall don't wait any longer to get a day booked. Here are a few pictures from the last couple days. Well it's September already!! Fishing on the rivers of South West Alaska had been outstanding, the silvers showed up in huge numbers in every river we fish this year making for easy scheduling and happy fishermen. I will be headed back to Michigan in 1 week and start King Salmon trips on the 15th of September. Openings are very limited but for anyone interested in hitting the river for Michigan Kings I have some days available for 4 or 5 hr evening trips. Steelhead dates are almost gone as well so don't wait any longer, I have 1 boat available due to cancellation on October 13, 14, 15, 17, 19 and 20 which are great dates also November 20, 24, 26 and 30 are available. 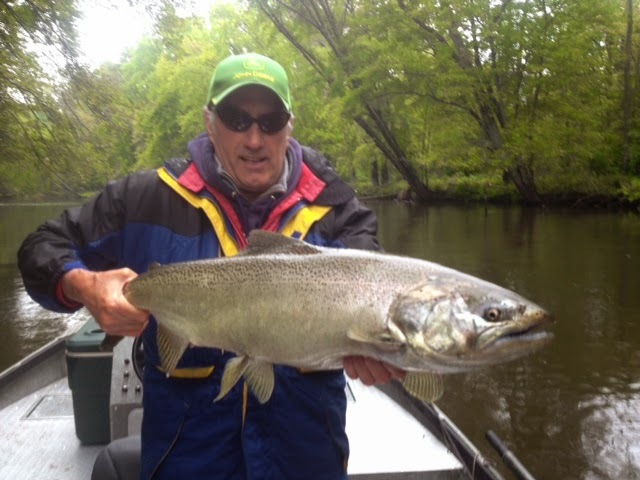 Reports of big Steelhead are coming from Lake Michigan again this summer so hopefully we will have a repeat of last fall with numerous fish weighing in the mid to upper teens. I have been on and off the water up here with a bad knee so pictures of me on crutches are not as much fun as fish but here are a couple. A couple Goodnews River Coho. Topwater action on the Togiak.